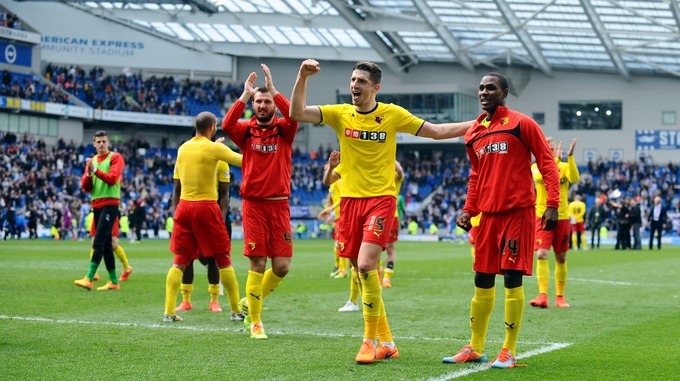 This website has never hidden it’s slight bias to Watford, and as you will be aware, season 2014/5 has been far from dull for supporters of the Hertfordshire club, with four different Head Coaches during the season, confirmation of automatic promotion to the Premier League after the penultimate game, and missing out on clinching the Championship after conceding an injury time goal in their final match against Sheffield Wednesday. For us involved in coaching football on a regular basis, Watford’s season also provided some added interest with their tactical flexibility throughout the season, which enabled them to set up differently depending on player availability, opposition tactics, and game situations. In the current era of ownership by the Pozzo family, Watford had set up initially under Gianfranco Zola with his preferred 4-3-3 formation, however this was changed quite early on to 3-5-2, which had become the most successful formation in the two seasons since. However it did leave the team open to opposition sides who had “worked out” how to deal with them, and changes made often appeared to be more a desperate throw of the dice than something planned for (as is often the case!) 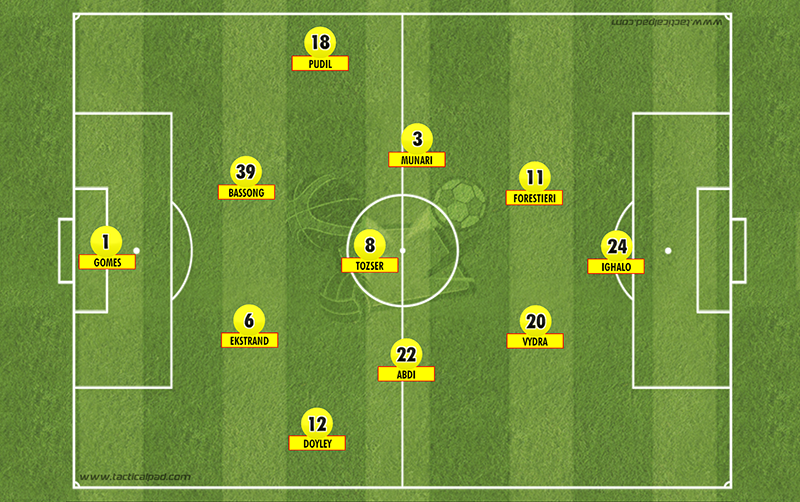 It was noticeable in the 2014/5 pre-season, that coach Beppe Sannino was working on the team being able to switch seamlessly between 3-5-2 and 4-3-3 without changes in personnel. The signings made were also with a view to alternative formations, with Leicester City’s Lloyd Dyer and former favourite Matej Vydra able to play in either. Vydra had a mixed season (although still managing to notch 16 goals), and Dyer never really settled at the club and was loaned out to Birmingham City in January. 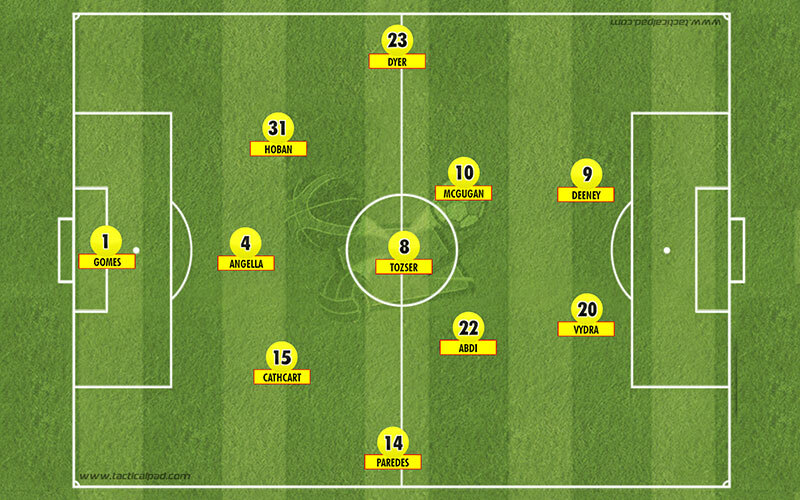 The above shows a pre-season example of how Watford, using certain line-ups, could switch seamlessly mid-game between the two formations by working on centre-half Tommie Hoban’s ability to play at left back and using Lloyd Dyer’s previous experience of playing at both left midfield and left wing-back. When the season started for real, 3-5-2 was used for opening day victory over Bolton Wanderers, however in the first month, 4-4-2 was also used on a couple of occasions (albeit in fairly average performances), the popular 4-2-3-1 was also used, and 4-3-3 finally made an appearance in the home game against Bournemouth in mid-September. One interesting dilemma facing the Head Coach at Watford was accommodating the array of striking talent in the squad, with captain Troy Deeney usually supported by either Vydra or Fernando Forestieri (see image below). 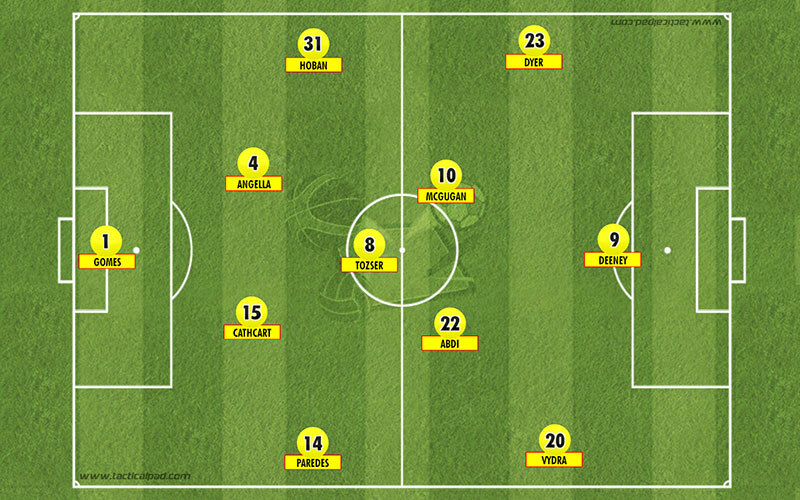 When Slavisa Jokanovic took over in October, he seemed to have found a solution by using a formation that would see all three in the side as shown below (a sort of 4-3-2-1), although this was during a period when Deeney was out injured which gave another striker, Odion Ighalo an opportunity to stake a claim for a place in the side. The issues this created however were firstly that it made Watford weaker defensively – Almen Abdi, the team’s most creative threat was forced further back, and neither Abdi nor the Hungarian Daniel Tozser are the strongest defensively. Gradually Jokanovic moved back towards a three at the back set up, although there were again various experiments with players further forward, with both Matej Vydra and Odion Ighalo used in more of a number 10 role. One of the key additions came in January, with the signing of Wigan’s Ben Watson, who provided some experience to the midfield and did the unspectacular work of winning possession and playing the simple pass for others to create. Watson made an interesting first appearance as a half time substitute as Watford struggled at 2-0 down to rock bottom Blackpool – it was him who won possession for Watford to break to pull the a goal back, the first of a record breaking seven. This was also an early example of Jokanovic being quick to recognise when things weren’t working and make tactical changes – in this game he had started with a 3-4-1-2 formation, but switched to 4-3-3 to change things, admitting afterwards he would have felt the need to return his coaching badges had he not made the change. Another issue that Watford had encountered from opposition teams was the early press on Tozser, an excellent passer of the ball when allowed time and space. Jokanovic started to favour Watson in the deeper midfield role, particularly after the addition to the squad of the talented Adlene Guedioura for his second loan spell of the season from Crystal Palace. 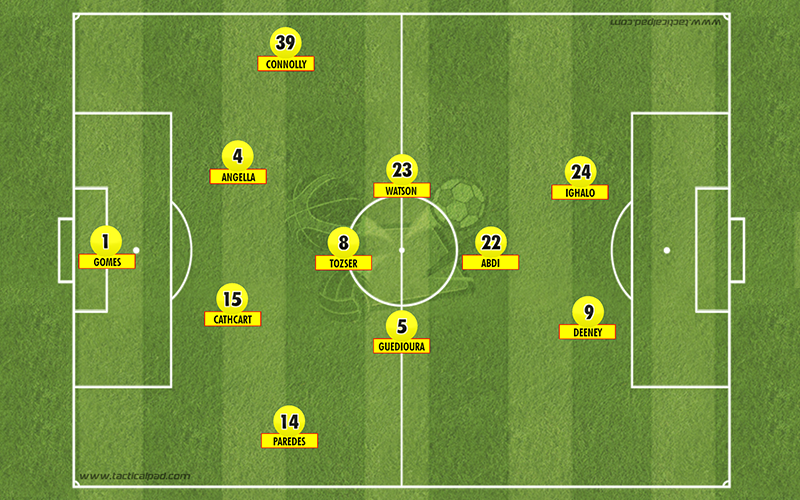 With the multitude of talent available in the midfield, Watford began to adapt a 4-3-1-2 formation (or a 4-4-2 diamond), employing attacking full backs who could push forward knowing that Watson or Toszer could drop in to cover, hard working box to box midfielders such as Guedioura and the Mexican Miguel Layun, and allowing the creative talents of Almen Abdi to play between the opposition lines. As Watford finished strongly, with just two defeats in their final 18 games, the team tended to alternate between the 4-3-1-2 and 3-5-2. This was never more evident than in the crucial penultimate game which as it turned out gained Watford promotion to the Premier League. With the team set up in a 3-5-2 formation, Watford struggled against a team who themselves at that point were not mathematically safe from relegation. Brighton took advantage of the space behind the Watford wing-backs, and so Head Coach Slavisa Jokanovic took the brave and decisive move to make a substitution with only just over 20 minutes played. Scottish international Ikechi Anya was sacrificed for midfielder Daniel Tozser, the formation was altered accordingly, giving Watford greater control in midfield, and a goal arrived less than ten minutes later. It was a far from fluent performance from the away side, but they hung on to grab a later second and clinch promotion. 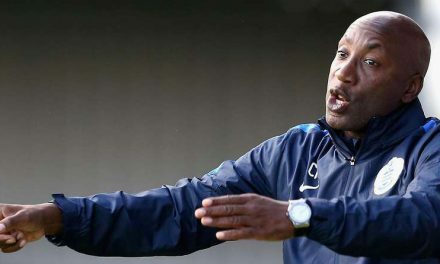 There were other games such as the away win at Wigan where changes in tactics had resulted in an improvement in performance, and it’s clear that the tactical flexibility gave the players and the coaching staff the confidence to be able to make changes and to solve problems no matter what the situation. Undoubtedly one of the issues in the British game has been the lack of tactical awareness compared to some of the European sides. I always find it interesting to observe when coaches decide to use a formation without considering the players available. 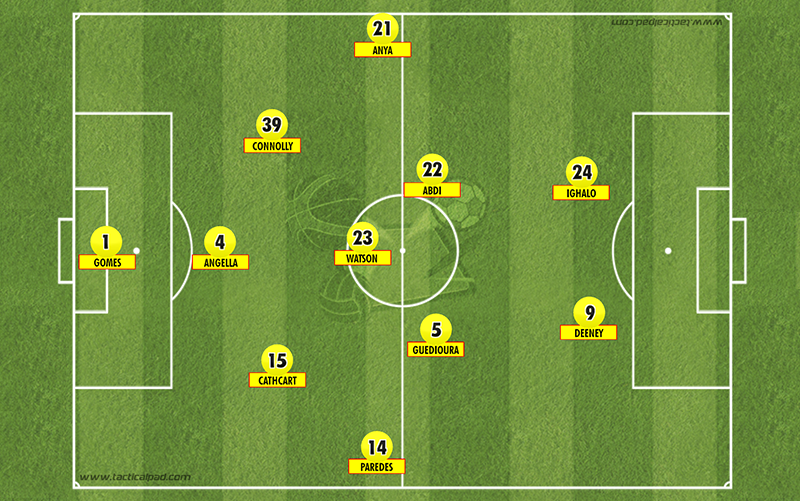 Regular readers of eachgameasitcomes.com will be aware of the look back at coaching the 4-4-2 diamond formation, which was chosen due to the strength of central midfield players available, but what observing last season’s Watford team has done has highlighted the need to have other plans available when the situation demands it. Subscribe to our weekly newsletter and receive top training drills to teach your team the positions, roles & responsibilities of the 4-4-2 Diamond Formation.